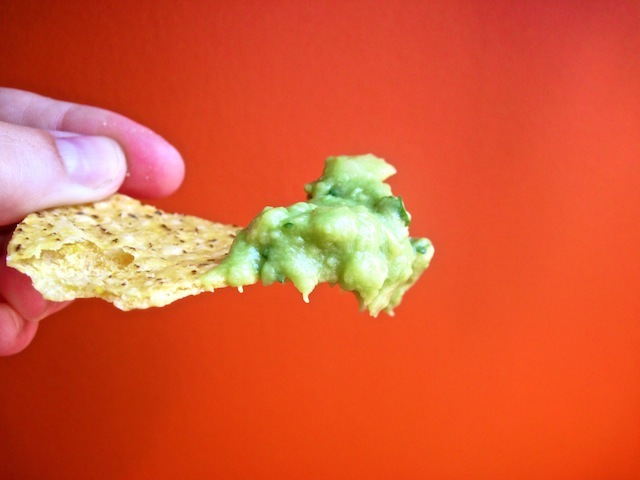 Dips on Chips: Guacamole – Eat Me. Drink Me. Me: Um, this guacamole is really good? The barrage begins again: Juan taught me how to make real guacamole. In Mexico, they just make it with avocado, salt, lime, and chile. That’s it. That’s real guacamole. That’s how Juan’s mom makes it. And there it was: the magical formula. Somehow I clung to this through the rest of that awkward dinner. My recipe life raft. 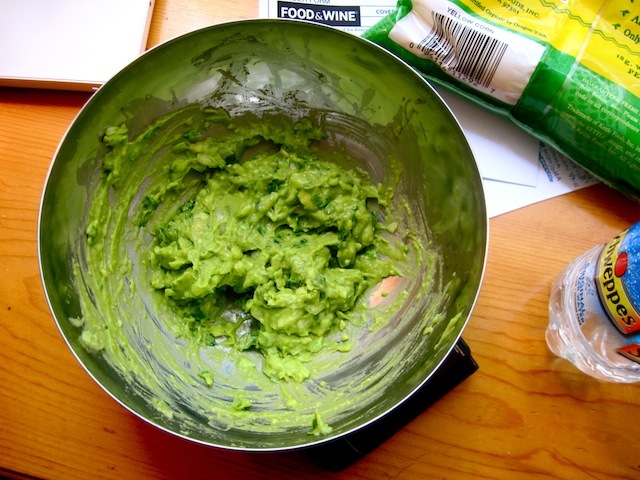 For a long time I was fanatic about using this guac recipe. I entertained arguments with proponents of other methods. One of these arguments even led to a guacamole competition, which turned into a guac and mojito party (more fun anyway…). Why I chose to believe this was the definitive method, I have no idea, but I became a guacamole evangelist. I brought guacamole to everything and made it on every occasion. Before I graduated I was approached by not a few people asking me to share the secret of my amazing guacamole. And I took on disciples to carry the torch of guacamole purity. But the secret, I think, is not so much just using these ingredients, but picking the very best avocado. I will not make guacamole until my avocado is just right and I only make guac with the small Hass avocados that squash submissively in my fingers. The other secret is: you have to mash avocados with your hands. I’m less of a fanatic now and admit that there are lots of ways to squeeze greatness from an avocado. But sometimes, when there’s just too much going on in my life and my clouded head needs a little metaphysical Windex, I look to my first guacamole love: avocado, salt, lime, and chile. And that’s all. This is the variation I’m presently eating. Mash avocado with your hands until silky and soft. Add remaining ingredients, alternating adding salt and lime juice until the balance is just right. You may need more or less than the amounts suggested above. I love the sensuous idea of hand-squeezinga ripe avocado; must try it. My own recipe is to food-process one avocado (with salt, cilantro, lime, garlic) and then to simply stir another diced ripe avodado and diced green chili into it. Great texture. you do make great guac. i like to use avocado (last time i made it i mashed with a potato masher), garlic, maybe some onion, lime juice, salt, cilantro, and chunks of tomato. and maybe some chili powder/hot sauce. Oh man, I love the looks of this dish! I’ve been enjoying letucte wrapped foods since it usually gives me NO problems and it’s so fresh in the summer. Hehe the other day, I cooked up some 되지 불고기 and had it with the korean fix-ins (it had been a LONG time since we had any), and it was awesome.